I wish all my readers, visitors and friends a very Happy Ganesh Chaturthi. And thought this is the right time to post a Peda recipe for "Lord Ganapati Bappa". This is simple yet another easy to make recipe from Ricotta cheese. Heat the ricotta cheese in a wide mouthed pan on medium heat for 6-7 mins. Stir constantly. The cheese would first loosen up and then the liquid starts evaporating. At this point you have to add the cream, saffron (crushed between your fingers/palm) and cardamom/elaichi powder and keep stirring all together till all the liquid dries up. Once the cheese gets its texture, its time to add the sugar. Now cook it on high flame till the mixture forms a ball. Keep in mind to stir through out this procedure, you will need strong arms to do this. JB (my DH) helps me out in the kitchen for this. Turn the heat off and let it cool a little bit. Don't wait for too long or else you will end up with hard lump of ball to work with. Shape them into modak or peda, which ever works best for you. If you have a modal shape mould that will save you some time or to shape into modaks, take 1 tbsp of mixture and make a smooth ball. Now, using the all your fingers pull a little bit of a mixture ,elongating it. Press the other side of the ball on the counter or the plate. To shape into pedas, take a tsp of the mixture, shape into a ball and flatten it a little between your palms. Its really simple and very much resemble like store bought. Have fun and enjoy this festival with loads of sweets and blessings from God Ganesha. Wow padma ,nice recipe from you for chavithi,it sounds yummy. Oh, gosh! Just the sound of cheese would make me drool over. 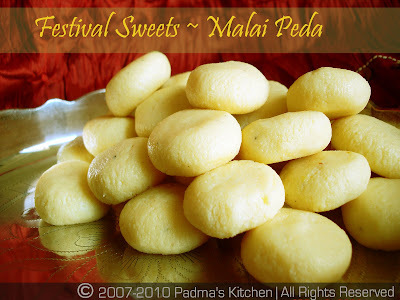 I haven't tried Malai Peda yet but I hope to try it someday. felt like grabbing some from your photo..
Malai peda is something new to me and they look very pleasing and tempting yummy! All your receipes are so good, delicious. And also the most important thing is that these are very easy to make. the best panda recipe i ever came across!!! 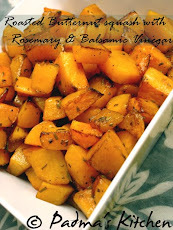 very easy to follow and turned out excellant.. taste so yummy !!! Thank you so much for sharing. I made this and everybody loved it,this was a hit among my kids.